I have heard that the windiest spot in California, maybe up and down America’s entire west coast, is at Point Reyes, located north of the City by the Bay – San Francisco. Been there, seen that. Altamont Pass is another windswept Golden State fixture, and, yet another, the Palm Desert region of the south state. Been there, seen those. Pretty much all prevailing air currents blowing off of the Pacific and onto land, move easterly or southeasterly. Pretty much, but not always. The exception during Santa Ana conditions where winds from the state’s southern interior blow out to sea. Sometimes breezes can travel southerly, like the time I experienced such riding my bike from Santa Maria to San Luis Obispo, California. The fierce headwind I encountered just wouldn’t quit. As a railroad signal employee, I frequently worked on my at-the-time employer’s line across, over and through the pass known as Altamont separating the east Bay Area community of Livermore with the northwest Valley village of Tracy. I’ve worked in all kinds of weather: fog, frost, heat, rain, wind and weather that was as calm as calm can be. I’ve (almost) seen it all. Enough reflection. Now, the mountains separating the two as-different-as-night-and-day Bay Area and Valley regions, helps keep Bay Area air and all that’s in it, if you’ll pardon the expression, at bay. 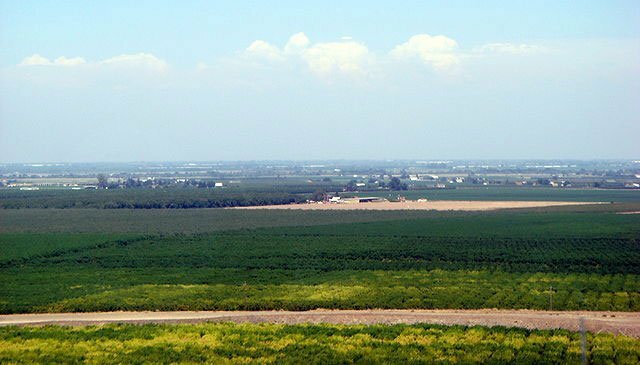 But, when conditions are just so, that same physical feature acts like a conduit, to funnel through and deposit such in that great big valley called the San Joaquin. I would imagine the same to be true but to a lesser extent of the San Pablo Bay, the Carquinez Straights and the Sacramento-San Joaquin Delta with ship channel and all. As to actually how much of the Bay Area’s air makes its presence felt here (the Valley), is anyone’s guess. What I know unequivocally is that the San Joaquin Valley Air Pollution Control District has, in the past, cited figures. Twenty-seven percent of the north Valley’s air pollution is both Bay Area and Sacramento Valley sourced. That’s my understanding. Lesser amounts can be found in the south, notably 11 and from 9 to 7 percent, in the central and south Valley portions, respectively. If accurate, that means the remaining 73 to 93 percent is Valley originated. And that could mean from motor vehicles, buses, trucks, ships, planes and trains moving into, out of or through. I would be remiss if I left out trans-boundary across-the-Pacific, west-to-east ozone drift. That’s probably not neither here nor there (immaterial, in other words), but it’s also probably not worth debating either as not all trans-boundary ozone drift hitches a ride on the jet stream into California and places within all of the time as the jet stream shifts. It could very well be that some of this stuff arrives and settles in the land of the midnight sun, in this case, Alaska’s northernmost reaches. At any rate, whatever the amount of Bay Area-produced air pollution ends up being Valley bound, just remember: it can’t get here without Mother Nature’s help. We’re talking breezes, serious breezes carrying with them automotive, industrial, refinery, manufacturing, power plant, agricultural-based emissions, whatever. But, if inquiring minds still want to know definitively, that there is grounds for conducting an in-depth study which, if not already done, would settle the matter once and for all. This post last revised on Aug. 15, 2018 @ 5:32 p.m. Pacific Daylight Time. Do the Altamont wind turbines have any effect? Fine or ultrafine particle pollution if anything when wind turbine blades are spinning. If so, the releases are probably minuscule, virtually nil, in other words.